Some interesting internal Apple slides have surfaced containing a breakdown of possible areas of growth in the smartphone market and could further back up ongoing rumors of the company introducing larger screen sizes on the next iPhone. Several reports have pointed at Apple looking into 5-inch (or larger) screen sizes for iPhone 6, and based on the slides it appears as though that's one of the only possible options Apple has at the moment. 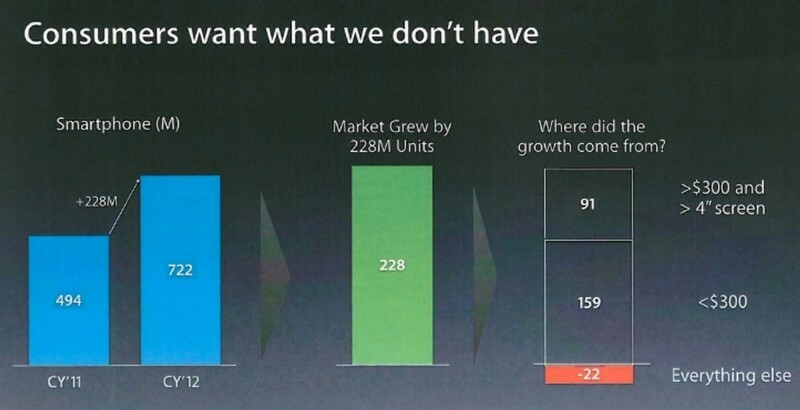 One slide called “Consumers want what we don’t have" dates back to 2012 and shows where Apple feels is the only remaining areas for growth in the smartphone market: devices with displays larger than 4-inches that cost over $300 and smartphones in the sub $300 category. The slides have surfaced as part of the ongoing legal battles between Apple and Samsung. As you know, Apple's smartphone offerings don't meet this criteria leading many to believe it's only a matter of time before the company takes its own advice and ships a larger iPhone. Sure it's possible for the company to make a current sized $300 iPhone, but as some suggest, it is unlikely that Apple will cut into its typically large profit margins or simply ship a cheap device. Some reports suggest, the demand for larger screen sizes in devices over $300 has only gotten larger since 2012, and that Apple may have missed the boat. Now two years past, it's hard to say whether Apple can achieve the kind of growth it wants just by increasing the size of the new iPhone, especially with the large influx of competitors starting to fall below the $300 price point.